have your eye on something at the shop? EVERYTHING OLD, EVERYTHING NEW at 20 % OFF! 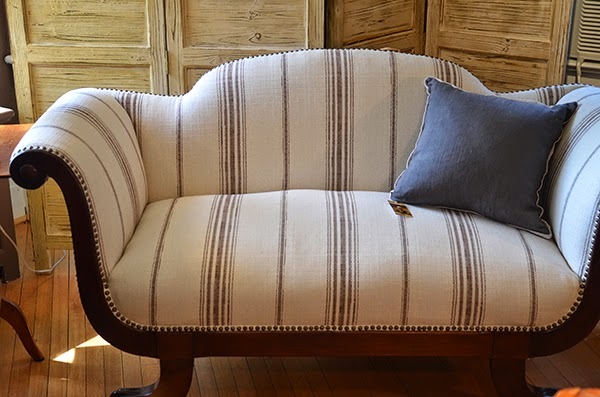 this includes this gorgeous empire settee . . .
Searching for the perfect gift? Antiquing in the Hudson Valley? We've got just what you need! Pretty Funny Vintage is located in a beautiful 1890’s Victorian at 80 South Broadway in the picturesque village of Tarrytown, NY... set on the banks of the Hudson River. Our shop features hand-picked vintage finds in furniture, lighting, textiles, jewelry and clothing, as well as a whole slew of new-fangled curious goods. And we've been at it for more than 25 years. For us, the best part of the job is the hunt – that's why we're constantly taking road trips up and down the East coast in search of comfortable, casual and slightly off-beat antiques. In the last few years we've added a new twist – we're not just about vintage anymore. We now feature a line of new gifts and decorative wares from around the world. Whether new or old, our well-curated inventory always shares an artistic edge and an individual viewpoint. So, if you find yourself in our neighborhood, stop into the shop. We're sure you'll be inspired by our ever-changing inventory set on two floors of fun. If you can't make it in, check out our online store. Now it's easier than ever to shop with us . . .
Be sure to follow us on Instagram, Facebook, Pinterest, and Twitter! Owner, Stephanie Leggio knows what it takes to keep her clientele happy. With over two decades of showing in NYC antique shows, along with weekly trips up and down the east coast scouring for goods, Stephanie has perfected the art of blending excitement for the off-beat with the comfort of wonderfully-loved antiques. Her time spent researching and building sets for the theater is reflected in her merchandising, which is more akin to set design than the typical stocking of shelves. Her clientele list of set designers and prop masters has resulted in the shop’s pieces appearing in multiple movies and television productions. Adding contemporary pieces that compliment the flowing inventory of antiques was a natural evolution. With two floors of ever-changing vignettes, the shop now carries a robust mixture of old and new, all painstakingly picked and displayed by Stephanie. The response to this new addition has been outstanding. Stop in for a visit, check out our new finds and then head out to discover Tarrytown and Sleepy Hollow. Only minutes away to many shops, restaurants, galleries and historic sites. Have a question? Send us an email stephanie@prettyfunnyvintage.com or give us a ring at 914.631.3368.
tomorrow, tomorrow, we'll be here, tomorrow... it's only a day away! OUR HUMONGOUS BIG FAT END OF YEAR "WE DON'T WANT TO COUNT THIS STUFF" SALE STARTS SOON! don't stress your shopping... we have everything you need right here!